Famous Five legend Laurie Reilly was among the Hibs stalwarts saying goodbye to the historic stand on Wednesday morning. Emotions were running high at Easter Road on Tuesday as Hibs fans waved goodbye to their club's historic East Terrace. Demolition work began on Wednesday, just days after fans graced the terrace for the last time at Hibs' match with St Johnstone. The old terracing is now being razed to the ground before work begins to create a new, larger capacity East Stand which will house 6,400 supporters and increase the ground's capacity to 20,250. Club Chairman Rod Petrie says the upgrading project will leave the club with one of Scotland's best football stadiums, and the largest EUFA compliant facility outside Glasgow. And while stalwarts of the club agree the demolition is all in the name of progress, there were mixed emotions when the wrecking teams moved in on Wednesday. Hibs 'Famous Five' legend Laurie Reilly experienced crowds of over 50,000 at Easter Road, both as a childhood fan and as a player in the 50s and 60s. He said the East Terrace held a deserved reputation as housing vocally passionate fans, adding: "That's why people paid their one and six to get into the game - so they could pass their opinions. "But it was a great atmosphere here. I experienced that when I was a wee boy and I came and stood in the terraces with my dad. I knew what it was like for the supporters. You're dead keen for your team to win and obviously when I came here, I was dead keen to win as well, for the supporters as well as the club. "But if you're born a supporter, as I was, you're a step ahead of the rest I think. I was brought up from here for as far back as I can remember." He admitted saying goodbye to the final terraces was inevitable, but sad, adding: "I only hope they get the people to fill these seats so that we can get some money into the club and buy. Because nowadays, the secret to success is to buy good young players. "In my day, we got excellent crowds, and it was a great atmosphere. And that helps you on the park, if you've got the crowds coming to see you. That had a big say in our success when I was playing at Easter Road." "People stood when I was playing. Nowadays it's seating everywhere, but then, people stood and they could move about and talk to people. And at half time, the Hibs supporters would move to the bottom end and the other supporters would pass them. There was always a bit of banter, but as far as I know, there wasn't a lot of trouble at all. "It is very sad that that atmosphere has gone these days. I don't think it can come back. Seating doesn't help. People liked to stand and move about and keep warm." The current East Terrace was expanded after attracting a record crows of 65,840 for the Edinburgh derby with Hearts in 1950. Club historian Tom Wright said watching a match in the East Terraces was a right of passage for many fans of that era. He said: "In the old days, people used to start their sort of supporter career in the East Terrace, then you'd gradually progress to the enclosure, then to the stand. But everybody's got great affection for the main terracing in any football ground I think. I may be unkind here, but I think you feel that that's possibly where the real supporters stand. "They'd be more vociferous in the main terracing, without a doubt. When you were in the centre stand or the enclosure, you felt you had to control yourself that wee bit more, you know. But the players would certainly be well aware of the main terracing." And he too said he would be sad to see the terraces go: "It's not only bricks and mortar. It's about emotion, it's about people we knew who used to stand there. The people who took you to matches. "My Uncle and my Dad took me to my first game and I almost had a wee tear in my eye a few minutes ago when I was thinking about them standing there and watching the terracing coming down. So it's not just about the bricks, it's about the people." Club bosses now insist that while crowds now may be smaller, the creation of the new stand will lead to a better, noisier atmosphere for fans. 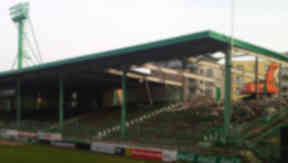 The new facility will not be completed until after the start of the next season but fans who held season tickets for the East terrace have been given replacement seats in the South stand. They will also be given priority when the new stand opens for seat selection.